To reflect on the significance of this achievement, I would like to share with you a selection of statements (shown below) from the courageous architects and engineers who, since the previous milestone, have signed our petition demanding a new investigation of the World Trade Center’s destruction on 9/11. As you ponder what it means to have amassed nearly 3,000 building and technical professionals willing to put their names on the line for the truth, I ask you to consider making a tax-deductible yearend donation to enable us to continue our work in 2017. 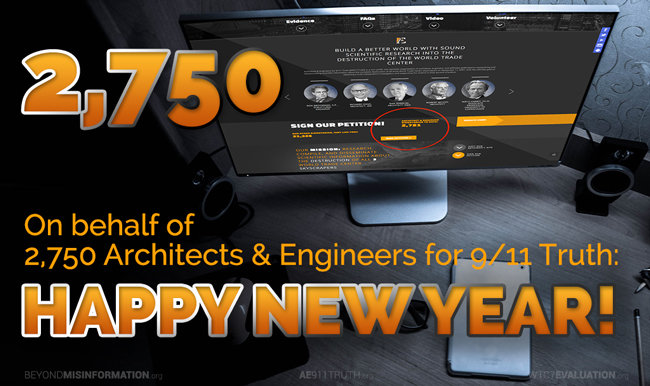 Your support is absolutely essential to our efforts to educate the architecture and engineering professions and the larger public about the paradigm-shifting truth behind the most pivotal event of the 21st century. As you well know, our shared mission is — and always will be — an uphill climb. Yet we continue to gain momentum with each passing month, despite the steepness of that climb.